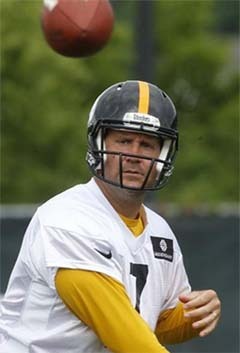 “Now a husband and father of two children, Roethlisberger is 32 and entering his 11th season. This is the fourth quarter of a career that could place him in elite company.” — Rob Rossi, Pittsburgh Tribune-Review. Roethlisberger arrived at camp in the best shape of his career. He’s not the first to do so, but Roethlisberger looks like he has overhauled everything, especially eating and workout habits. When was the last time Roethlisberger didn’t accept the burden of typically insane expectations for the Steelers? When was the last time he tossed a teammate or assistant coach under the bus? When was the last time somebody said something bad about his actions on or off the field? When was the last time he wasn’t what Pittsburghers expect of a Steeler? Unless we’ve been watching an amazingly scripted stage play the past three years, Roethlisberger has grown into a humble, hard-working leader of this proud franchise. Roethlisberger is going to retire as a Steeler. He may retire as the Steeler of his generation or a Steeler for any generation. The quarterback with 29 winning drives in the fourth quarter has the ball. We’re watching a career-defining comeback. One reason @_BigBen7 prefers to remain #Steelers player rest of his career is he wants to raise kids in Pittsburgh.